If you want to play in a lottery syndicate, these are the very best available online. You can read detailed reviews of each below. Search By Country - if you want to find the best syndicate based on the country or lottery games they play, click here to jump to countries. Live In The USA? - if you live in the US, your options are very limited. Choose from the US syndicates listed here. TheLotter Syndicates Plenty of syndicate options for all the most popular games (plus regular ticket buying too). From a well established 15 year old company. WinTrillions Syndicates Lots of good syndicates to choose from including multi-game groups. From another well respected online brand. You Play We Play UK based, this small professional syndicate company plays EuroMillions, UK Lotto and Thunderball. Play from just £2.00 per draw. LottoLishus New kids on the block offering novel easy syndicate options for US Powerball and Mega Millions. Based in the USA. WinTrillions Powerball and Mega Millions Syndicate A 'big draws' syndicate covering SuperEnalotto and the US Powerball and Mega Millions in one package. WinTrillions Irish Lotto Syndicate WinTrillions have been managing online ticket buying since 2006. Now they have an Irish syndicate too. Florida Lotto Magic A decent Florida Lotto syndicate with some great extra bonuses worth more than the membership fee. Marios Canada Lotto 649 Groups Very good amateur Canada Lotto 649 and Super 7 syndicate. Big Fat Lottos 10 years of experience running syndicate groups for UK Lotto, Irish Lotto, EuroMillions and Spanish Superdraws. Syndicates here are listed separately as they differ from the regular ones above. They cover special event draws or e.g. those that run once a year. El Gordo de Navidad Syndicate Insane Spanish Christmas El Gordo draw. Massive prize fund, huge number of prizes. Plain crazy and I love it. New syndicates do launch fairly regularly. Although most do seem to underestimate the amount of work involved, and often close again fairly swiftly! The best lottery syndicates as listed here have a proven track history. But all syndicates have to start somewhere, so if you're feeling adventurous you can also take a look at those pending review. Just tread carefully. Why Play In A Syndicate? Playing in a national lottery syndicate means you get better chances of winning in every draw. No silly mumbo jumbo, no idiotic junk science or fake maths - just the simple idea of buying a lot more tickets. A lotto syndicate is the only guaranteed way to better your chances. And your chances can be radically better starting right now, today. The cost is no more than most people spend on the lottery anyway. The only downside is having to share the jackpot! Lottery Syndicate World contains reviews of many different syndicates from countries all over the world, but above are our quick links to the very best. These are definitely the ones you should look at first. 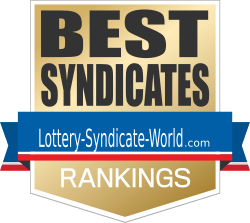 If you run a syndicate we haven't reviewed yet, and you think it's worthy of being listed here - submit your national lottery syndicate for review.